So flying to Hong Kong from Frankfurt for 3 nights is not something most people think makes a whole lot of sense...Germans for sure not. But, I am so glad I did! Hong Kong now lives in my imagination and inspires me in a way that a city hasn't impacted me for some time. It was my first trip to Asia. It won't be my last. Honestly, I've never really had a strong urge to explore most Asian countries. I'm not sure why. It could be because I don't really enjoy the attention I receive about my height, and well, in Asia I was pretty sure that the attention would be exponentially increased (I wasn't wrong). If any of the Asian countries had really intrigued me before, then it was India, but I really didn't want to go there alone. As I was planning where to go I pulled out a map and quickly realised that I also didn't feel like flying over North Korea in this current political climate, with Trump due to be in that region the exact week I was planning to be there. So, Japan was out, and so was South Korea - both incredible countries, I have no doubt. Hong Kong proved to be the perfect choice for me. It is a very safe, easy-to-navigate, inexpensive and incredibly interesting city. I had no qualms walking down any street I decided to turn into, wandering around, getting lost, and exploring the fascinating corners that I came across. It is like New York (a city I know very well) on crack. Apologies if that comparison isn't fair, but the noise, the bright lights, the cultural impacts as obvious as fire hydrants on every corner, the shiny bank towers looming over the very busy waterways below, ferries, tourists, quick getaways for locals, and food, such great, great food. Hong Kong has energy. I still feel it as I sit and write about it 3 weeks later. There is so much life buzzing by, which I found incredibly life-affirming, coming from the chattering of the masses and the hum of constant traffic. But what struck me like hammer to the head was the aroma wafting over the streets. I couldn't place the smell and still don't know what it was, but when I bought a rice noodle-soup bowl with beef balls (a very unfortunate translation), radish and broccoli from a street kiosk, I recognised the same intense aroma floating over the sidewalks. I can only assume that it's an ingredient in the broth. 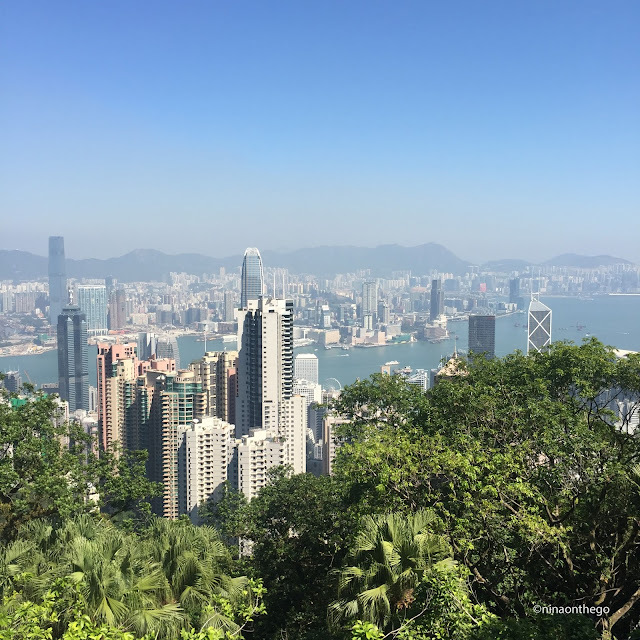 On my first morning, I took the bus in order to see more of the city, to the Peak lookout at the top of Hong Kong Island. The weather was a beautiful 27 degrees Celsius and the skies were blue with just a hint of haze. I opted not to do the hour-long circular walk around the peak in the interest of time, but I have heard many recommendations that it's a must-do tour. I just had a shamefully short period of time to do everything on my list! I loved travelling around this city, swiping my Octupus card everywhere I wanted to go. With an Octopus card (identical to London's Oyster card) you can pay for all of your public transport needs: ferries, buses, and the metro. When you need to top the card up just head to any 7-11 store or metro station - it's very easy and very handy. The fares are so cheap that even with my island-hopping, 2 long bus rides, and many metro jaunts, I didn't even spend 15€ in total. Visitors, listen up! 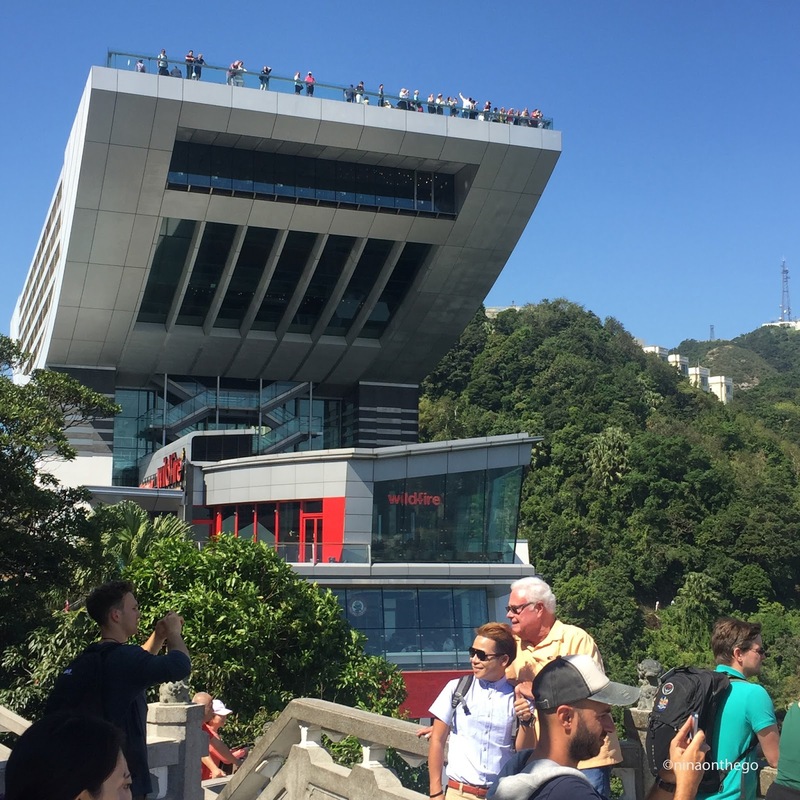 Don't do the Hop-On, Hop-Off bus tour in Hong Kong. Really. 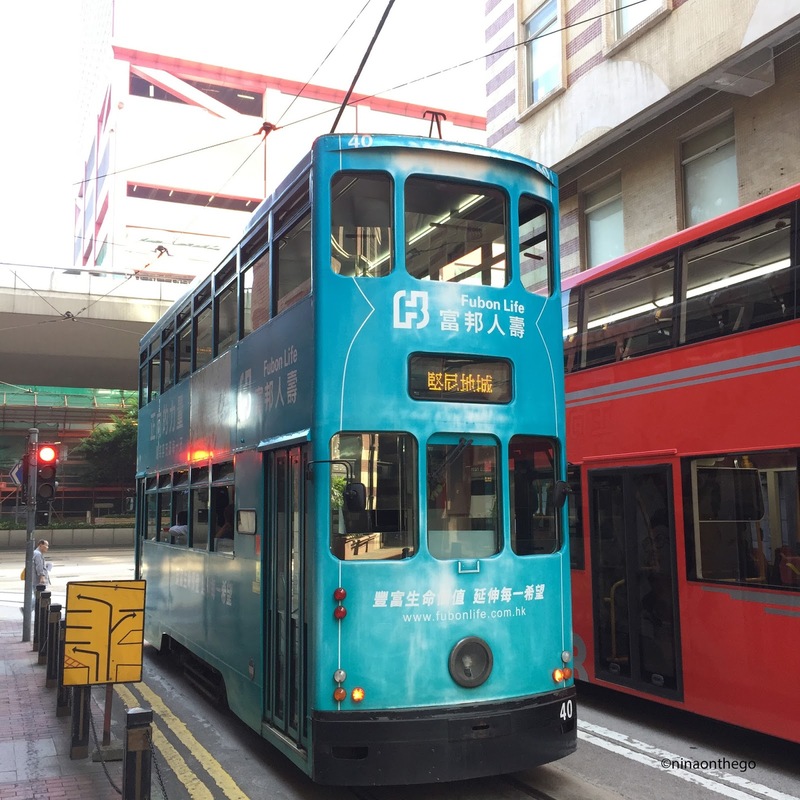 First of all, it's much more cost effective to get an Octopus card, and secondly, you will miss out on so much of Hong Kong's flair - like riding on the Ding Dings (Hong Kong's authentic double-decker tram cars - my new favourite thing to do!). You also shouldn't miss the experience of Hong Kong's incredibly efficient and very clean metro system. There is so much going on in the under ground, and you never need to wait long for a ride! After the Peak, I bused back into the city and then jumped on the ferry to Lantau Island from Pier 6 at Central Station. It's roughly a half-hour trip, out among the many fishing boats and ships zigzagging through the South China Sea. With my rice bowl and beef balls, for which I didn't even pay 3€, I disembarked the ferry at Mui Wo and walked directly to a waiting bus driver (New Lantau Bus #2) who was frantically waving me over. I climbed aboard and settled in for the windy, approximately 35 minute trip, to Po Lin Monastery and the Tian Tan (or Big) Buddha. As I walked towards the long steps leading up the Buddha, which I knew lay ahead of me, I saw the cows. I am quite the fan of cows, not sure why, maybe it's a Canadian thing. Here on Lantau Island, the black and terracotta-coloured longhorns were just wandering around the monastery grounds, checking out tourists or trying to ignore them, while Big Buddha watched over his flock. Huge and silky, curled up (as much as cows can curl up) on the grassy patches among the tourists or looking into the shops and picking out souvenirs. Although the Tian Tan Buddha is relatively young, completed in 1993, the impression he left on me was one of historical significance, of being in the presence of someone who has been entrusted with the care of millions who adore him. It felt as if I had spent tender time in the presence of a wise old soul. Whether you are Buddhist or not, it's difficult not to be in awe of the dedication with which the Chinese acknowledge and humbly (as far as I could see from the non-tourists around me in silent reverence) submit to Buddha and the deities serving him. At the very least, I found it very beautiful. The Po Lin Monastery is much older than it's Buddha neighbour - built in 1906 by 3 monks from the Chinese mainland. It's a complex of various ornate buildings, infused with gold accents, dragon heads, every colour of the rainbow, and small buddhas which hang under the eaves like chubby gargoyles. The intense, but calming, scent of incense permeated the air among the monastery grounds. Worshippers could buy bundles of incense sticks to burn and place in large and small cauldron-like pots filled with sand. Back in the city, I noticed many sand-filled pots with burnt incense sticks outside kiosks and stores lining the sidewalks. Back on the bus, after spending a little bit of time in contemplation (which such a monument invariably effects), I headed toward Tung Chung, on the northern side of Lantau, in order to take the metro towards my evening destination of the Mongkok markets in Kowloon. Everywhere I go I take photos of hanging laundry. I don't know why, but I love laundry...except my own. 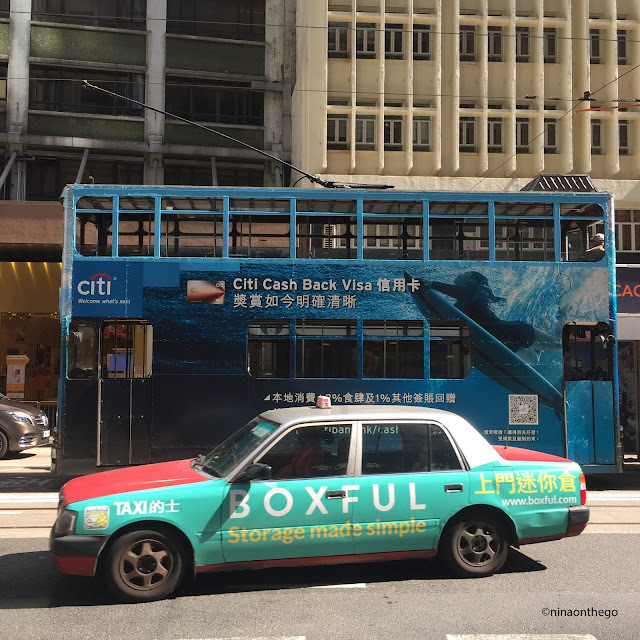 In Hong Kong, clean clothing and sheets and towels hang out of most windows and off most balconies, dressing up the sides of narrow apartment buildings like fringe on a well-worn suede coat. Old men sit on make-shift stools of stacked crates or plastic boxes and just watch or wait, I'm not sure. 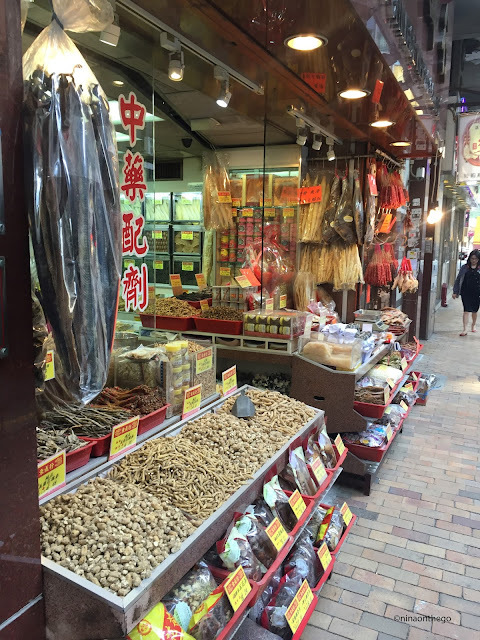 Small shops line the sidewalks selling everything from dried sea creatures to teas and packages of, what I can only assume, are mysterious herbs and potions. Kiosks offering fish balls, beef balls, soups and skewers, bowls and sweets, pop up all across Kowloon, creating an enchanting, almost whimsical atmosphere among the crowds (at least that's how it made me feel!). You can't go hungry in Hong Kong, but you might need to stand in line! I stood out walking down the street as if I was screaming 'Hey look at me, I'm a really tall white girl! ', so I didn't need to actually say anything to anyone - they noticed me immediately. I just smiled and took photos. Usually I try to blend in when I'm touristing, but here I realized there's no chance that I'll look like I belong, so I'll just stand in the middle of the street and take photos. The men sitting on their crates just watched and didn't seem to care one bit. For a while I walked away from the big, bright lights of the main streets and crowds, in order to get a feeling of where people actually lived. But, here in Hong Kong, people live everywhere. I turned a corner to go down a narrow road overflowing with, not tourists, but families and elderly folks. I had stumbled upon a real market. Shoppers were picking up bamboo (for what? 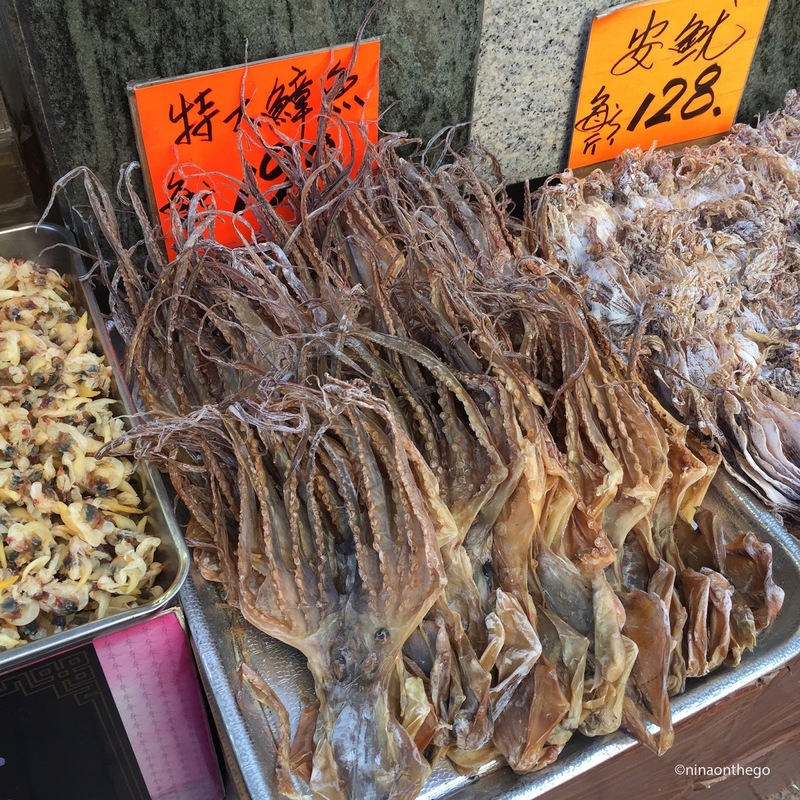 ), riffling among tables of large, unfamiliar fruits, perusing dried animal parts like duck necks and octopus tentacles, and admiring every vegetable you could ever need. I was on Canton Street - only locals, no white people (that I saw), everyday life. I could've stayed all day. By 8pm I was exhausted, totally jetlagging, and very hungry. I decided that I desperately needed some dim sum and sum drink drink. Tim Ho Wan, whose Kowloon restaurant has a Michelin star, is said to have some of the best dim sum anywhere, and so since I had never tried it I figured why not head to the best. It is also very inexpensive. Win win. I ordered spinach shrimp rice wraps and BBQ pork buns (which so many onliners have said is an absolute must!). Both dishes were so delicious and filling and cost only 6€ total! The sweet pork filling of the buns still makes my mouth water weeks later. But, like a macaron, one or at the very most 2 is enough...3 is just too much of a good thing. So, go with a friend! Another must-do in Hong Kong, which I had read a lot about before I came, is to ride the Star Ferry. These ferries are a cultural phenomenon, shipping 70,000 people daily between Kowloon and Hong Kong Island. National Geographic has named the Star Ferry crossing as one of the '50 Places of a Lifetime' - check! Because it is such an efficient and reliable source of transport, and very inexpensive, it is beloved by locals and tourists alike. I also made sure to check out the Hong Kong Island skyline while I was on the other side of the harbour. It is an incredible sight, unlike one I have ever seen before. Honestly, my words can not do it justice. All I can say, if you have the opportunity, short or long, to visit this city and an outer-lying island or two, then don't miss it. I am already trying to figure out when I can get back...this time for much longer. Stay tuned for my upcoming post on hiking the Dragon's Back Trail, named Time Magazine's Best Urban Hike in Asia!